Like many others last Saturday, I purchased the latest Apple product to hit the market, the iPad. I gave my first impressions at the beginning of the week, but I have used it fairly extensively over the past week and hardened my opinions of the device. I still believe the iPad will not replace your normal computing devices. There are too many limitations on it to properly be a dedicated computing device. I decided I would try to write the blog post about the iPad on the iPad, but was partially foiled by the iPad’s inability to type within the WYSIWYG text area in the editor. I am writing it now in HTML mode, but the the inability to utilize all scripted web pages is a problem (and I don’t refer to the lack of Flash). The other big problem with the iPad is that it is a “walled garden.” Apple only wants you doing things their way, so it makes it harder to move things on and off the device easily to backup, edit elsewhere, etc. Most apps can share via email, but sometimes that is just not enough. Navigation If you have used the iPhone, you know how to navigate the iPod. Using it on a full size screen becomes revolutionary. This is a computer for those who are unable to work with computers. From small children to old people, this will allow them to access information in ways they never could before. This iPad may be the first generation device, but with time, it will change the way we use computers completely. We have been using computers the same ways for 20 years and it’s good to see someone finally changing the way we use them. Screen 9.7″ screen with 1024×768 resolution looks brilliant. Videos look crystal clear, photos have very crisp resolution and games play at silky smooth frame rates. The larger screen also allows for much better touch sensitivity than the iPhone and even after zooming in, the screen is very clear. Keyboard The on screen keyboard takes some getting used to. I prefer the larger landscape keyboard to the smaller portrait one, but it is a smaller than normal keyboard size. I feel like I’m slowly getting to the point where I can touch type, but the lack of feedback takes longer to get accustomed to it. 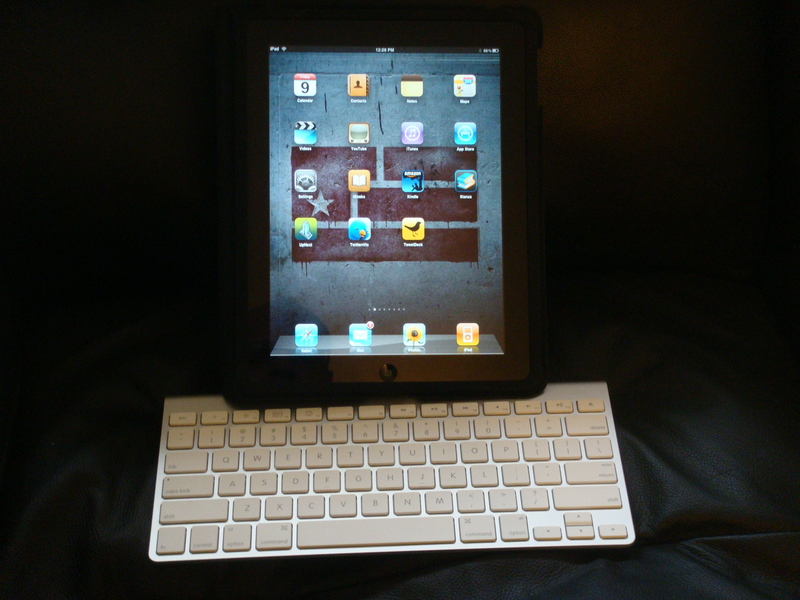 I am writing this blog post with an Apple bluetooth keyboard connected to the iPad and can type effectively, but it’s not the most portable of solutions on a machine that is so thin and lightweight. Applications When you are starting out with 100,000+ apps already in the app store, you are off to a strong start. All iPhone apps will work on the iPhone at either iPhone size or zoomed out to full screen, but many of the iPhone apps do not look good zoomed in due to the quality of the graphics used. The apps that are made for iPad or are universal apps that are made for iPhone and iPad look superb. With so many different apps available, you’re guaranteed to find something you like, from iBooks to games to productivity software. Battery Life The iPad can last for days depending on usage. The only times I see the battery drain is when I watch videos on it, and even so, the battery charges fairly quickly. The iPad will not charge while in use on USB, but when it goes idle, it will charge. Otherwise it can be plugged directly into the wall for even faster charging. Camera Unfortunately, there is none. There is an app that will allow you to use an iPhone 3GS as a remote camera for the iPad, but since my iPhone is only 3G, I haven’t had the opportunity to try it. Media Player It’s an iPod. Like the iPhone, it can play MP3 music and MP4 video that is loaded via iTunes. There are also streaming apps like ABC.com and Netflix that allow you to watch videos with a Wifi internet connection. Of course, music sounds great and the videos look and sound clear. Email With a client similar to the iPhone’s, the mail program is good. I miss some of the Gmail functionality that I get on the Droid, like threading messages by subject and labels, but the layout of the titles and messages on the Mail app are nice. Those should features should come this fall with the 4.0 OS, but the Mail app does the job for now. Productivity As said above, I had a few problems getting started on this blog, but was able to write it on the iPad after a little trial and error. There are other productivity apps like iMockups to mockup webpages and apps, Pages to word process, Keynote to run presentations, Numbers to do spreadsheets and Evernote to organize your ideas. I don’t like the closed system that won’t allow me to move files on and off the iPad easily, but it’s nice to have the ability to do work on such a portable device. Multitasking During the iPhone 4.0 announcement yesterday, it was revealed that multitasking would come to the iPad this fall, but I don’t feel I will be able to multitask in the way I need to work. For example, when I write a blog post, I have one browser window open to write the blog, a second one to reference old blog posts, a third to do research or get links to put into the post. To do this with the iPad would be too time consuming and arduous due to the inability to switch quickly between windows and copy and paste data I need. The iPad won’t be replacing any of my other computers any time soon. I do like what Apple has created in the iPad and I think it’s just the beginning of what will come. As the iPhone led to the creation of the Android smartphones which led to Apple being forced to incorporate some features and innovate others, I feel that as other similar table devices join the market, we will only see this segment of the market grow.